Photo credit: jimmiehomeschoolmom on Flickr. In IELTS Academic Writing Task 1, you'd usually find that the instructions would ask you to "report on main features" and "make comparisons where relevant." With this in mind, you consequently have to select the most evident similarities and differences within the presented data. How could you mention similarities? -One technique is that you could use the phrase "as _____ as". On the other hand, how could you state differences? There you have it. In IELTS Academic Writing Task 1, always remember to mention similarities and differences in the data. Again, this could help you improve your skills in IELTS writing. We hope that you find this post useful. Cheers! 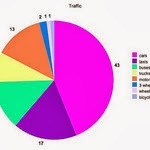 Attribution to SocialMediaToday and its article "Best Social Media Stats and Market Research of 2010 (So Far)".